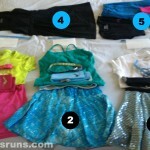 So what do you pack for Ragnar? If it’s your first-ever 200-mile two-day relay, you have no idea what to take with you — other than guess that you should probably take three running outfits, one for each of your legs. Oh, and yes — to confirm what’s on your mind right now: I am that person who packs for vacation the day of our flight… but Ragnar? Four days to go, and I’m nearly packed. Well, not nearly, but today I took care of the most important stuff. The outfits. Of course! So here was Phase One, laying it all out: Outfits for Legs 1, 2 and 3 (as numbered). Sparkly Skirt for Leg 2, as it will be in the dark (and you know what reflects stuff best? Sparkly things.) Another Sparkly Skirt for Leg 3 and to cross the Finish line with the team. 4. SkirtSports Serendipity dress for van hangout. (I was going to say in between legs, but that just sounds weird?) It’s super easy to put on/ off, one-piece clothing: winner. 5. Sweat pants, two shirts (long and short sleeves), calf sleeves, hoodie and stuff for night time. I ordered them last week, with Code PCBLG for 40% off and free shipping. It might still work, if you want to try it out. So yes, my friends! 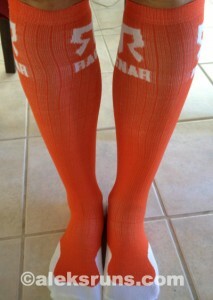 Despite my little spill the other day, Ragnar is still on! With rest, luck and a couple more chiropractor visits, of course. I think I’m not even half-packed! 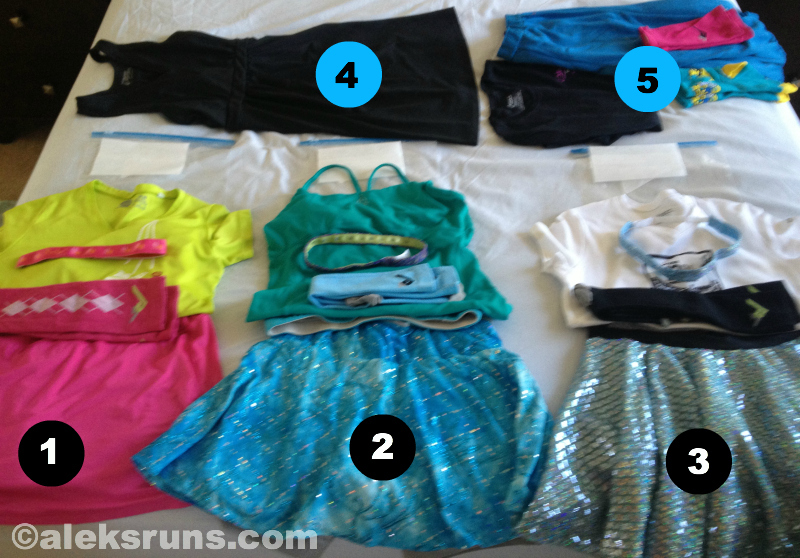 So much other stuff to consider – run accessories, snacks & things, and more things… 🙂 And thanks, I love the Sparkly Skirts! 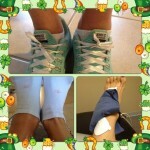 Very comfy for running, too! I’m so excited for you, Aleks. Love all the outfits! Also – know anyone who’d be willing to drive a mini van for Team Nuun? Ohhh…. sadly I don’t. Our team captain is taking care of everything and I don’t even know who’ll be driving our vans! Do you need someone to take shifts with you, or someone for a second van? Hey! 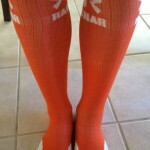 If you see a van driver in a black walking cast around the exchanges during the relay – that’s me! Say hi!